Join Victoria as she fishes with the top Bass Guide in the Carolinas... Multiple tournament winner, Capt. Jimmie Hair as he covers how to catch Bass Step by Step! Jimmie discusses Rods, Reels, various types of artificial baits and how to work them, Rigging techniques, color selection, locating good Largemouth structure, Boat control, and much more. 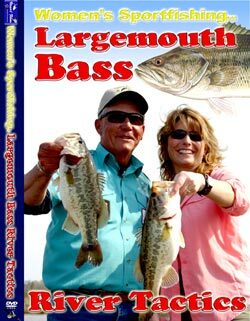 Jimmie gives you the benefit of his 30 years of Bass fishing knowledge as well as good fishing spots in the Santee-Cooper area. If you want to learn how to catch Largemouth, then this film is for you. So join us at one of the best Bass rivers in the country, the Cooper River, to learn what it takes to catch the most popular fish in America... The Largemouth Bass.